ABA Dental Clinic provides experienced orthodontic care in Thunder Bay, ON to straighten misaligned and crowded teeth (malocclusion). Teeth that are straight are not just more attractive, they are also healthier. We provide professional orthodontic services to improve both the appearance and well-being of your smile. Contact us to find out more about our orthodontic options! Crowded, overlapping teeth are difficult if not impossible to brush and floss thoroughly. This increases the chances of tooth decay doing damage in the hard to reach areas between teeth. Bacteria then thrive in these areas and can cause a variety of oral and overall health issues. 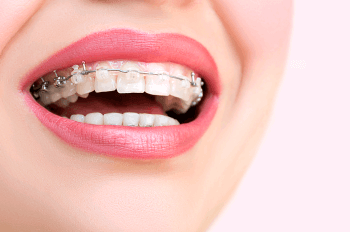 Traditional Braces – We offer traditional orthodontic treatment with a choice of bracket colors for children, teens, and adults. Some patients will benefit best from traditional orthodontic treatment, which is why we also provide full braces for all ages. We include options such as multicolored bands and ligatures or use tooth-colored brackets and wires for discreet treatment. Invisalign® Clear Braces – We offer clear, removable dental aligners to treat teens and adults discreetly and effectively. Invisalign® Clear Aligners are an excellent choice for teens or adults looking for an alternative to traditional treatment. Phase One/Early Orthodontics – We provide early orthodontic intervention to prevent or reduce the need for complex orthodontic procedures in the future. We also extract teeth if the jaw is too small and they inhibit the proper development of adult teeth. To improve the oral health of our younger patients, we offer habit-breaking appliances that deter thumb-sucking. Then, beginning at age 7, children should have regular orthodontic evaluations to determine the most beneficial treatment intervention options. During the introductory phase for orthodontics, we can better address problems associated with undersized jaws or other bite issues. We monitor the dental development of our young patients and evaluate when braces and orthodontic care will be the most effective. At ABA Dental Clinic, we are dedicated to helping families develop strong, healthy smiles. Call us today for more information or to schedule an orthodontic consultation.